As I am nearing the defense of my dissertation, I thought to glance back at some of the software I have been using to write my dissertation and other academic stuff (book chapters, blog posts, abstracts, applications, etc.). First, I must confess I spend far too much time on evaluating and trying out different apps that might get me to be more productive. I also acknowledge that I obsess far too much over the design of the software. I admit this. Obviously, it is part of my excellence in procrastination. Workflow or app for notes. Besides these, I am going to mention small utility apps that make your life just so much easier. But before delving into the software, I want to say a few words about operating systems. I think we should think of the operating system (as well as the apps we use) as our digital office or environment. Just as physical surroundings matter, similarly does digital ones. Not many of us would like to write their academic work, or anything, in filthy stinky places, or far too crowded supermarkets or whatnot. So, if you have the possibility (If your hands are tied because of the choices of your university or work, I am sorry.) spend a minute on thinking about the operating systems and frankly, just ditch the Windows 8,9,10 or whatever Windoes version you are using. Life can be better. Personally, I am using mac OS as my system, but there are whole candy shop of different Linux distro's out there for free. Mac is accessible and friendly, Linux is somewhat easy, and also you’d support free software. If you really really really like Windows and have tried life outside and still like "indows, go ahead continue using it. I won't judge. Same or similar programs are out for windows, don’t worry. So the first app, I’d recommend getting is a citation manager. Your university probably has something like RefWorks or something, but shop around a little. A proper citation manager saves time and makes life easier. They can create a list of references for you; you can organize your pdf’s and other research material in them, you can read and comment content in them, and much more. I am using Papers, which is an app that costs money. I know it’s shocking, the bloody developers want money for their work. But, for me, it has been worth the money, although the ride has been a bit bumpy. + It is available for many platforms and can be synced to a cloud folder, meaning I have my whole library with me wherever I go. + When writing, I can press a key combination and open a little window and search the citation needed. When found papers insert a little citation code for the citation. When the article is done I can automatically process the citations in the required style (Paper supports, finds and updates thousands of different citation styles from APA to Harvard to many of the journals own weird citation styles. + Paper works as a pdf reader with useful tools for highlighting and commenting. It can even convert your pdf:s into dark mode, making reading in dimly lit rooms easier on the eyes. + It integrates with my University’s proxy, meaning I can search and read all the journals my University has access to. It even has a readymade setting for my University. I just need to know my username and password. + When searching papers it can find relevant articles for you, and show tweets where the article is mentioned, etc. + It can automatically found and fil the missing info on your pdf:s such as publishing info, author, editors, etc. + It can import pdf’s automatically from a selected folder and it has a button for a web browser that automatically imports the webpage or pdf from the browser to the app. - It is buggy. Sometimes it crashes. Sometimes it slows down. - Sometimes the citations are not placed correctly, and you still have to edit them manually. That said I had not found better citation software than Papers and I have tried them all. But I have heard some really like Mendeley, which is free but is owned by Elsevier, which tracks the usage of the app. Others like Zotero, which is open source but does not have as many features than Papers. Then there are others, but I have not heard many good things about any of them so that I won’t mention them here. So try it some of these, they are either free, or inexpensive, and offer a downloadable free tryout version. So you probably have noticed that writing is something you do quite a lot? Therefore, it should go without saying, that the text editor you use should be carefully selected so that it fits your need and feels comfortable. But, it pains me to see how many use Microsoft Word for writing. And I do get it. Everyone asks for a .doc-files and sends you them. But, still, I’d encourage you to try something different. Life is worth living. Microsoft Word is a monolith and, right it can do a great deal, but let’s face it, it’s a behemoth, a Godzilla that has recently abandoned its helpful little paper clip buddy. Word needs to be left alone for a while and only used when necessary. If you absolutely want a Word-like experience give LibreOffice a go. It’s a bit nicer and free software. But I’d recommend traveling farther. There is a whole land of beautiful lean text editors out there. Personally, I use Scrivener, but I’ll mention few others here as well. + It collects all my texts in one, easily manageable space. + It backups ALL OF MY WRITINGS AUTOMATICALLY! So in case, I’d hypothetically spill water on my computer on an airplane on my way to a conference, I have everything backed up in the cloud. + I can modify the workplace to be just as I like. I can have notes; I can see my footnotes; I can go into distraction-free writing mode, etc. + It supports markdown and multimarkdown if you're geek like that. + The same app is available for iPad or iPhone, so I have all my writing with me if I want it. + I can quickly create different kinds of pdf's, or even ebook straight out from the app. - When you are working collaboratively, you have to copy and paste your text from Word-document. That’s not very nice. - There are so many possibilities that it might take time to understand it. Although, you don’t need to know them if you don’t want to. That said, there are few other apps that excite me, and if I were not that deeply steeped in Scrivener, I would give them a better chance. First, there is Ulysses, that is almost like Scrivener, but more minimalistic and more heavy on markdown. But it seems very nice. 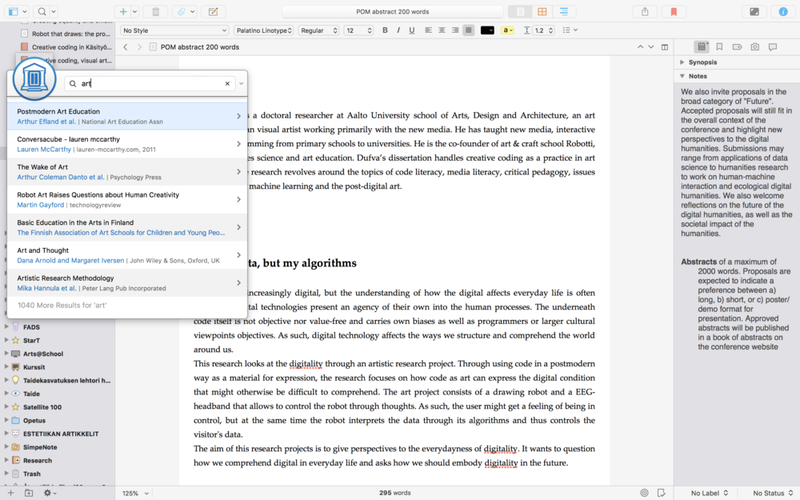 Then there are Manuscripts a whole writing app, directed for academics. It has lots of nice features, like it supports many scientific journals templates, integrates your research data and stuff. Last, there is the world of text editors made for programmers. Because of this, they are often well featured and with lots of features. I have use Atom, which is free software provided by the Mozilla foundation. The way I use these text editors is that I write my texts in them, add citation codes with papers, and when I need to send the article, I compile it with a full reference list and open in Libre Office and export it as a Word-document, or Pdf. It sounds like too much extra work, but it’s not. Last essential bit of software is note taking. You know you are in the conference, paying attention, lost in your thoughts and an idea strikes. Where do you write it so that you can find it later? I have seen many use pen and paper, and I think that can be a workable and enjoyable workflow. Pen and paper are one of the best user interfaces if you ask me. Anyway, I tend to use Simplenote, a basic note editing app, that syncs with my mac. I get an idea, write it as plain text in Simplenote and can find it later on my mac. It’s fast and straightforward. Simplenote supports tags, but I never use them. But there are millions of note taking apps out there for any platforms, have a look and try them out. All in all, I feel that the note-taking system has dramatically benefitted my work. I can find and come back to my notes quickly. Simplenote syncs with Scrivener, so you can automatically have your notes there, but I tend not to use and manually go through the notes and transfer the ones I need. Besides these, I think there are few things I could not live easily without. First off is Alfred, which is a quick launch app, that works similarly than Apple's spotlight, but is much faster and more extendable. Alfred is free, but there is a powerpack you can purchase, which is absolutely worth the price. With the powerpack, you first and most importantly get clipboard history!!! If you do not know what clipboard history is, sit down and take a deep breath, your life is going to change. Does your work include the need to copy and paste things and it feels like a chore to copy and then paste and then copy and then paste? What if I told you that you could just copy all the things and then paste them? That is what clipboard history is, it can keep hundreds of your copied items in history, and you can return to them whenever you need, it is all there. You can even append copied files together and a whole lot more. There are lots of standalone clipboard managers, but Alfred’s is excellent, works well, provides a lot of functionality and is included in the powerpack. Furthermore, Alfred has scriptable workflows, so you can convert currency, look IMDB, eject your disks, put the computer to sleep and lots more with just a few clicks of the keyboard. Second, excellent little app is PopClip. It gives you this iOS-like contextual menu when you are selecting text. And you can shape this contextual menu to your heart's content. For example, I can highlight a piece of text and then with a single click do a Google or Google Scholar search based on the selection, see how many words the selection contains, and much more. There is a whole website full of downloadable workflows. One thing I often use with Popclip is a thesaurus that I have linked to the menu, so when writing I can search for synonyms for the word. Third thing is Textexpander, which is a little program that expands a shortcut to a predetermined text. Mac os has similar possibility built in, and Alfred does this also, but I started using Textexpander before there was anything other like that and just used to it. Also, it does it’s thing flawlessly. Few examples: When I was writing my dissertation I had some pretty hard to write names I had to write all the time, I just created a handy and rememberable text shortcut for it, and the name was written for me automatically. Other is that when filling info, I have snippets for all of my different emails, address, the whole name of my University and department, etc. It is just handy. Try it. You can do pretty fancy stuff with Textexpander, like create a whole letter, where you fill some things, like name or whatnot. But haven't used any of these. Last, do you know that you can paste and match the style of the text by not pressing cmd+v but command+option+v? Amazing, I KNOW! If you are using Mac are you aware of Setapp? It's a subscription service, that allows you to use over hundred apps, Ulysses and Manuscripts among them, for a monthly fee. It can easily be worth the price, depending of course of your usage.